Solid Wood Construction: The plans for this bench use all solid wood for the top, sides & legs. The bottom is made from 1/4" hardboard and is routed in to the sides of the bench. This is much stronger & more durable than benches that merely have the bottom stapled on. If the bottom is only stapled on, once you have the bench filled with music books, the bottom gets pushed out. 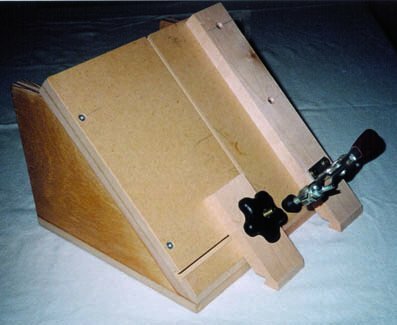 The corner brackets are also made from solid wood & are attached to the sides with a sliding dovetail joint. This is where most piano benches are weak that use a metal corner bracket. The brackets tend to break out easily. Included with these plans are also plans for building a dovetail jig so that you can cut the ends of the brackets at a 45° angle. 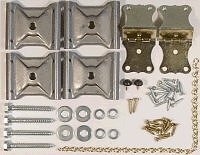 If you prefer to use metal corner brackets, I have a hardware kit available which includes the correct size of metal corner brackets. 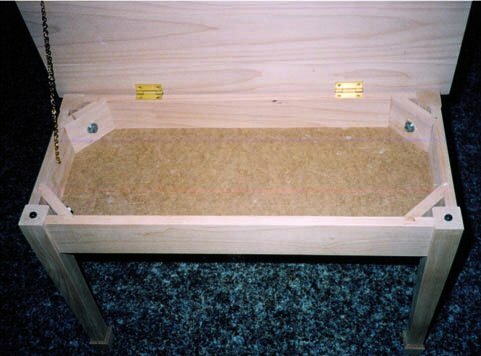 Click here for more information on piano bench plans.